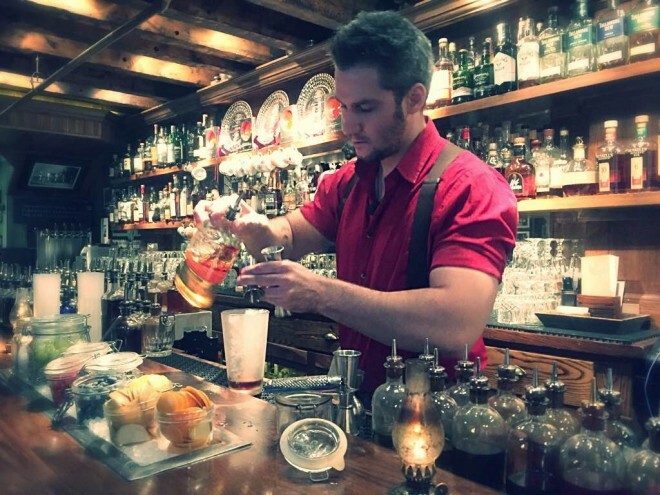 Hi, I’m Gregory Buda and I’m a bartender at The Dead Rabbit Grocery and Grog in New York City. I got trapped in the world of bartending about 10 years ago. I was a Phd student at Cornell, studying biology and I worked in a bar for cash on the side. As my Phd also involved chemistry I guess that’s partly why I fell in love with cocktails, because of all the science involved in making the drinks. I began to study how people used plants and various ingredients to make alcohol and became fascinated how products interact with each other. I worked in a bar in Ithaca, teaching about whisky, the chemistry behind the distillery and how to produce different flavours. Then I took a break and decided to come to NYC… and here I am. I don’t want to open my own bar. I am more interested in the education side, how alcohol is made and the culture around it. My ideal scenario would be to become a spirit educator like Steve Olson, teaching about categories of spirits. I am fascinated by whisky, mezcal and sherry. Travelling and bringing knowledge to staff allows you not to have a bar. You can bring the knowledge to people, they don’t have to come to you. When I go out I love to go to cocktail bars. I find inspiration there and even if I don’t want to drink a cocktail, I like the ambiance and here in New York, you have a lot of choice. Sometimes I need a break from cocktails, so I’ll go to bars for a simple spirit or a beer. I use cocktails as a lever to introduce spirits to people who wouldn’t normally be comfortable with them. Currently I love brandy, which is becoming more trendy as people understand how to use it. Most people have the feeling it’s something their grandparents used to drink, so they don’t know what to do with it. But I love it. It’s gentle and floral so you can use it in delicate cocktails. It’s also a challenge, because you can’t pair it with ingredients that are too strong, so you have to be considerate when deciding what to use with it. It’s about balance. There are different schools about cocktails. Here in Dead Rabbit we go for complexity, whereas my background with The Beagle it was more about simplicity. But whatever the style a bar chooses, a cocktail should have technique and balance. I love to work with sherry, that’s my secret ingredient in cocktails. It adds a layer of complexity to cocktails and works like a binding agent balancing sweetness and acidity. There are many different styles of sherry, so you need to find the right profile for your drink. My go to is Amontillado as it’s easy to pair with spirits and food as well. I love to pair sherry with food at home and it’s the most versatile type of sherry in my opinion. A good pairing is kind of win-win for the dish and the cocktail. I think you have to go Attaboy here in New York and meet Dan. He is responsible for my love of sherry and mezcal, he’s a very knowledgeable person. Also I’d say Julia Momose who runs Green River in Chicago, she is incredibly smart and you have to watch her work behind a bar.